The Girl Scouts of Greater Los Angeles want young women to be excited about careers in the videogame industry. As regular Escapist visitors may be aware, the Boy Scouts of America recently introduced a Game Design Merit Badge that can be obtained alongside Athletics or Backpacking. Of course, one inevitable question that followed was "What do the Girl Scouts get"? As though in response, the Girl Scouts of Greater Los Angeles have partnered with Women in Games International to design a new Game Development badge for the program. Even better, the new badge isn't simply gender-swapping the Boy Scout patch, but also places a strong emphasis on software design and prospective careers in the game industry. The badge's design is still being worked out, but the principles behind it are clearly stated. "Our ultimate goal is to create a STEM-aligned (Science, Technology, Engineering, and Mathematics) video game badge," said WIGI vice president Amy Allison. "Creating this badge will get young girls excited in technology and science and let them know that they, too, can have a career in the video game industry." For comparison's sake, the Boy Scouts Badge requires a physical or digital prototype, with no special emphasis on software development. The Girl Scouts version, on the other hand, uses the Gamestar Mechanic development tool to ensure that both design and software principles at being taught at the same time. Even if the Game Development badge is a reaction to the Boy Scouts' version, it still sounds like a great program. The games industry could always use strong female voices, and encouraging interest among youth is a great first step. 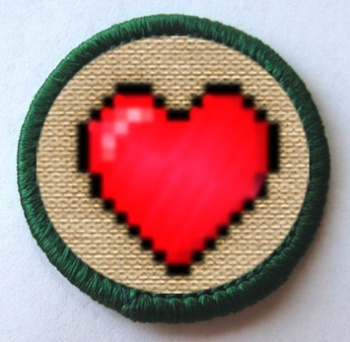 Hopefully the Game Development badge, or one like it, can eventually be adopted by the Girl Scouts of the USA in the near future.